What are we trying to achieve with a call to action? Lately, I’ve become obsessed with writing calls to action for our clients’ blog articles. I have enjoyed trying different types of calls to action, switching up my wording and putting them in not just at the end of an article, but throughout the article. I realized that I’ve never covered this topic on R & R Web Design LLC’s blog. It is time to correct that. In this article you will find information about what a call to action is, how to write them, and templates you can start using today. I’ve done the research and here it is for you all wrapped up with a pretty bow. Before we can start writing powerful calls to action, it is helpful to know what they are. Here are three definitions I have found that help to remove the fog over this topic. 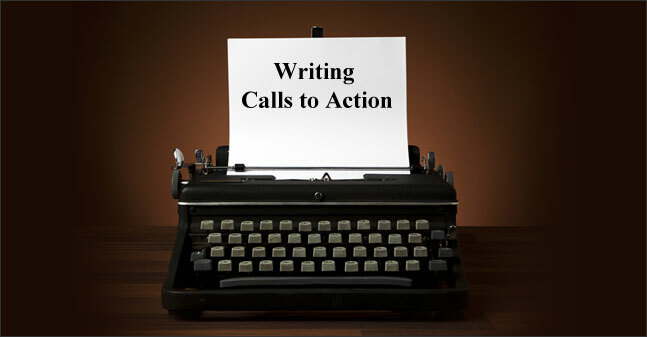 There are some key components to writing calls to action. Below you will find the key components I have gleaned from the above definitions and from my research. Answering: What Do you Want? First you have to ask yourself, “What am I trying to get the reader to do with this article.” You have to know what you want them to do before you can convince them to do it. Are you trying to keep them on your website? Would you like them to subscribe to your email list? Do you want them to download your e-book? Whatever it is, you need to know what you are trying to accomplish with your article as well as your call to action. You will notice that most of the definitions contain the words now and immediately. Calls to action are for right now, not later or tomorrow but rather right now. To help keeps things immediate, make sure that the call to action is clear and super easy. Literally, my favorite call to action article that I found is Brooke Ballard’s 20 of The Best Calls to Action. Her examples are so stellar because they are simple and easy, making them a no brainer to click on. Many of her examples are less than 6 words long. In article by Hubspot, I saw a call to action that simply said, “check out this blog post”. The words stood out in that classic blue that makes you want to click, the link worked, and it lead me to a page that was actually even more helpful. In another article by Hubspot, they stated that verbs won the battle for getting your call to action more share than adverbs, adjectives and nouns. I have already shared Brooke Ballard’s dynamic list of calls to action, but did I mention she has two? 20 of the Best Calls to Action and 20 More of the Best Calls to Action. Hubspot has so many articles on calls to action that it can be hard to dig through exactly what are looking for. I found one that is extremely helpful though. Their article, Resistance Is Futile: 17 Calls to Action You Can’t Help But Click is outstanding when looking for examples of companies utilizing calls to action. The goal of our calls to action are to help convert. The information that has been collected for you in this article provide what you need to turn your plain and boring calls to action in to powerful and clickable calls to action. Do you like what you see? Sign up for our email list, what do you have to lose? ‹ Copyblogger is Done With Facebook – Are You, Too? Thank you so much for another shout out, Christine! I appreciate you. 🙂 And this post … the CTA is where it’s at!! You are so welcome. I could not cover the CTA topic without mentioning your articles. Great information. Love the list from Brooke. The list from Brooke is so great. Thank you for stopping by and checking out the article! As usual, another clear, concise, full of valuable info blog. Thanks. A CTA is one of the first things we pick up and assume we know what it is and how to write an effective one. Just adjusted 1 of my thoughts. Thank you so much! I’m so glad you enjoyed the article. What thought did you adjust?